I had only one small clue to guide me: the word Tullicro. It’s where my great, great, great grandfather James Menzies was born, in 1792. Turns out it’s a fermtoun or township, a commons community, half way up into the hills rising on either side of the tumultuous Tay River. I rented a bicycle from the gas station near the bed and breakfast where I was staying in Aberfeldy (named after the spirit that is said to inhabit this particular spot, where there are a lot of rapids). I cycled around asking the locals to guide me. An old farmer raised a work-gnarled finger and pointed up the road. The next laneway, he said. There’s a sign at the bottom…. And so I went, pushing my bicyle up the hill. At the top, I found the ruins of a traditional Crux cottage that once had a byre at one end where the cows and chickens were kept. I stood transfixed: this was my portal, my way in. I knew it. I had no idea really. 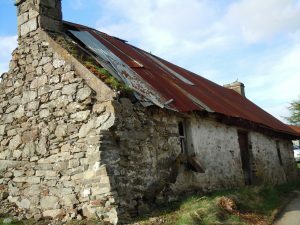 But instinct prompted me to make inquiries and the next year I was back, able to rent one of the restored buildings in this old walled community, a bothy. “Tullicro became an archeological dig site to me, a place where I could connect what I learned over the next two years from reading all I could get my hands on about the commons and the history of everyday life in the Highlands. When I returned to Scotland from Canada, I rented the smallest of the renovated buildings on the fermtoun, what had been a bothy (a sleeping quarters for unmarried men and hired hands). It was and still is a simple granite box of a place with two small windows on either side of the narrow, low door, the key to which is a long, iron latchkey, which scraped matching iron deep inside the thick plank of wood that was the door as I unlocked it. I moved in my stuff, and turned on the heat, glad of the mod cons that had been added with the renovation. “I picked some flowers from the yard outside, weeds really, but pretty still. I took my time arranging them in a mug, set this on the table where I’d eat and work during my stay, then went to air out my bed. I took my time. I walked the fields where my ancestors had labored semi-communally, with scattered strips of the infield shared out by lots. 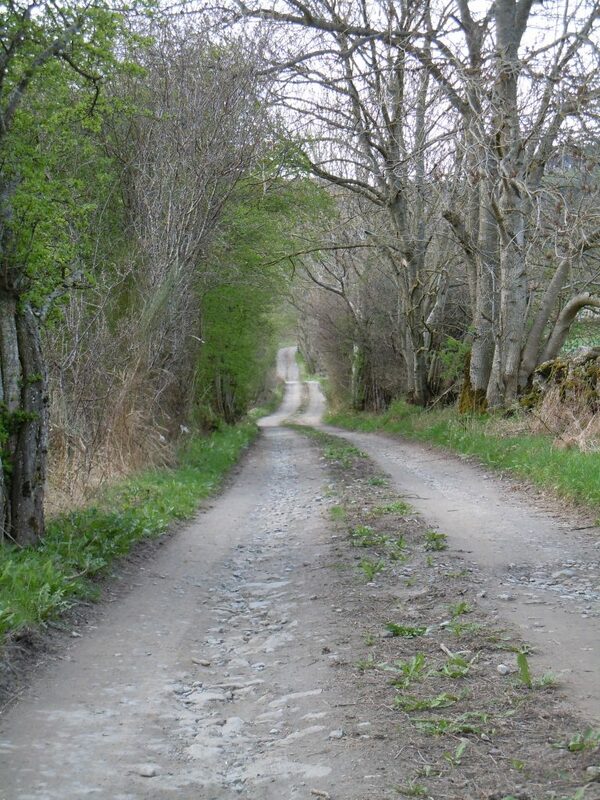 I sussed out where old pathways, called loans and driftways, which also served as common rights of way used to be. “I found a stone that seemed more than just another piece of glacial erratic. It might have been a march or mark stone from the days when Tullicro was a flourishing common. Large standing stones were used to mark the boundaries of land that was farmed in common, boundaries that my ancestors “marched” at least once every year in a ritual ceremony to ensure that no one had erected some hedging or fencing, enclosing a bit of land for private gain. In one account at least, any such evidence of enclosing would be summarily destroyed, with axes and mattocks carried along for the purpose. This entry was posted in Author and tagged commoning, commons, Highlands, Scotland, Tullicro by heather. Bookmark the permalink.